Fancy dress costume descriptions and information regarding historical masquerade balls, primarily of the 19th and early 20th centuries. Text and illustrations directly from period sources. Frontispiece of Masquerades, Tableaux and Drills, published by Butterick in 1906. 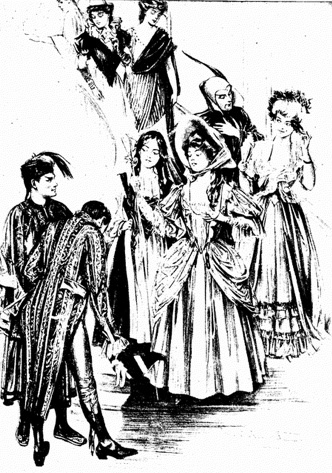 Newspapers of the era often published lists of the costumes worn by guests at fancy dress balls. The lists were typically provided in advance, so it's possible not all of the costumes worked out, as anyone who's ever tried to finish a costume at the last minute before a ball will understand. The lists below are from a fancy dress ball held by British expatriates in Singapore and are taken from an article on the ball published in the Singapore newspaper Strait Times Weekly on February 23, 1884. On Thursday evening, the Fancy Dress Ball, which for some time past had been looked forward to, took place at the Town Hall. The upper room is well known to all visitors as being one of the handsomest in the Far East. On the present occasion it was simply and tastefully decorated, in a manner which was well adapted to enhance the architectural features of the building. The result was such as might have been expected from the interest evinced by the fairer portion of the community, and the skill and attention they bestowed upon their costumes, which contributed so materially to the success of the entertainment. One could not fail to notice, among the many handsome dresses, that there were several in the disposal and arrangement of which the fair owners displayed an intimate and correct knowledge of true artistic and aesthetic principles. The style of the costumes was exceedingly diversified, some being of a purely classic type and thus pertaining to the tragic, while there were some which were the representatives of comedy, and others again which successively adopted comic character. ...Dancing commenced shortly after nine with an opening quadrille which extended the entire length of hte Hall. The floor was in excellent condition, and the music was performed by the Regimental Band of the Royal Inniskilling Fusiliers. It is no wonder that these and other attractions rendered the visitors loth [sic] to part, and prolonged the dancing after supper far into the small hours. At what precise time the company would have separated it is difficult to determine, as dancing only stopped upon the Band playing the National Anthem. The entire article may be found online at the website of the National Library of Singapore. In looking through the lists of costumes, some trends are obvious: historical costumes of the previous few centuries, characters from plays, and national/ethnic costumes of various kinds. Classic fancy dress costumes such as Harlequin and Folly are also represented. More unusual examples are the gentlemen attending as "Bat" and "Paint Box" and the lady depicting "Economy." There are also a few cop-outs: "Civil Service Uniform" and "Evening dress, 19th century" suggest that not all the attendees made any special effort at costuming. While some couples may have coordinated costumes -- the Cavalier and the Lady of the 17th century appear to be husband and wife -- it is actually more common for the costumes not to match: Ralph Rackstraw wth Follie, Peasant of the Black Forest with Persian Lady, and so forth. The substantial disparity in numbers between ladies and gentleman probably reflects the nature of society in a distant colonial posting of that era. The Mahdi, Sultan of Kordofan, &c.
Oh dear. Someone's gone all patriotic but forgotten their history. Triple Alliance - I had to check the dates, but this would be Germany, Austria-Hungary and Italy rather than the South American one. The Ancient Masher - googled this and found this. Nice ruff and cane! Undergraduate - Obviously it's not jeans and a t-shirt. Academic robe and hat? Helvetia - This lead me to the wikipedia National Personification page, which is interesting. One of my sources has a Masher costume for a little boy. Uncle Sam is the national personification which springs to mind, being an American, but I was also aware of John Bull and Marianne.